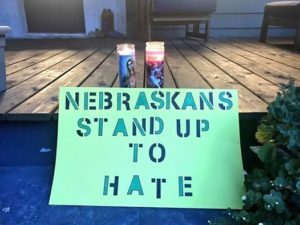 After the terrorist acts by White Nationalists and Nazi groups in Charlottesville, groups in Nebraska quickly responded to show strong support for those that stand up to hate groups. On Saturday, August 19, Nebraskans will hit the streets again to visit with neighbors at their doors and where they hang out to engage in conversations to move our state forward. Join us at the Saturday events. Help move our state forward. Come to one of these locations Sat., August 19, group trainings will start at 10am and 1pm, however, you can join us anytime between 10am-4pm to go door-to-door visiting with Nebraskans. 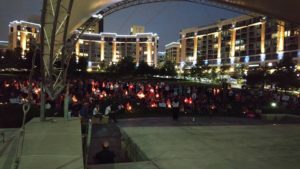 Grassroots groups like, Indivisible Nebraskans, Women’s March, and Democratic Socialists of America alongside Democratic activists started planning vigils so people had an outlet to express their grief, frustration, and outrage at the murder of Heather Heyer and the violence of hate groups. A huge turnout in both Lincoln and Omaha, with 500 people in Lincoln and close to 1000 in Omaha, shows how Nebraskans stand up for justice–always. 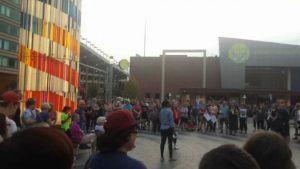 Speakers from different groups spoke to both crowds about racism and how we can move forward and stand against hate. Some of the speakers included Democratic elected officials and candidates, such as Brad Ashford and Kara Eastman. Democratic leaders came to show their solidarity with those who were hurt and affected including Bennie Shobe, Carl Eskridge, Mina Davis, and Jackie Collett. 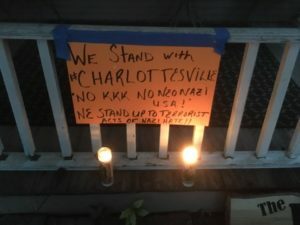 “I couldn’t make it to Lincoln or Omaha tonight for the #Charolettesville vigils, here is our families sign and candles standing up to hate” – Nebraska Democratic Party Chair Jane Kleeb. Thank you to everyone that came out to show that we never tolerate the terrorist acts of White Supremacists. Democrats know that our diversity is our state and country’s strength. We encourage you to come to our Resistance Summer canvass on Saturday, August 19 to keep standing up in the streets. It is through actions that we win. All summer long we have been engaged in rural, urban and suburban communities visiting with Nebraskans at their homes and where they hang out to listen to the issues they want us to focus on as Democrats.